A new Edina design studio and showroom specializes in nursery and toddler room decor. Maya Malinski and Paige Cannon explore a kid-friendly tent inside Bambino Décor’s showroom. When you’re in the ninth grade, the idea of starting a business sounds like a brilliant—and completely feasible—idea. Fast-forward a couple of decades and add elements like kids and a mortgage to that once-dazzling plan, and you might have second thoughts. But that’s not the case for Edina native Trina Eibon. She’s been working on her business plan for years, and it’s finally come to fruition. Bambino Décor opened its doors in the fall of 2013 near 50th and France, but the idea has been germinating in shop owner Eibon’s mind for years. Eibon, an interior designer by trade, kept coming back to the idea of opening a showroom and design studio specifically for nurseries and toddler rooms. In 2013, she launched Bambino with friend Jamie Sullivan, a long-time sales representative who has since moved on to other projects. And that’s the mission: Eibon wants Bambino Décor to be top-of-mind when it comes to designing rooms for growing families. Katie and Jim Douglas of Edina turned to the Bambino Décor owner when they found out they were expecting their second child. They already had a nursery, but wanted help transforming the brown walls of a home office into a cheery and bright bedroom suitable for their firstborn daughter, Mae, who is now 4. Fortunately for the Douglases, they didn’t have to. Eibon did most of the envisioning, sending seven vision boards to the couple for review and feedback. 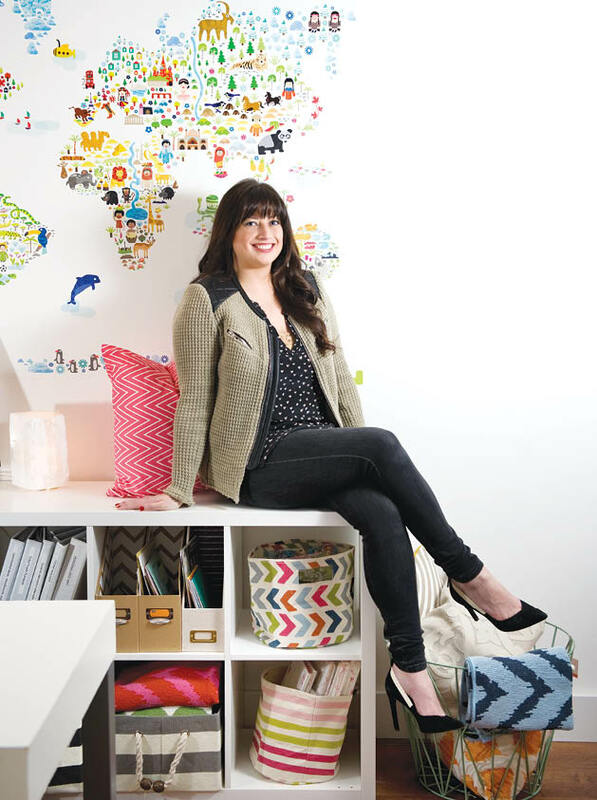 Bambino Decor shop owner Trina Eibon enjoys helping families design special spaces for their children. “I created a mix of boards showing traditional, eclectic and sophisticated selections, as modern and contemporary didn’t really fit with the feel of the rest of the home,” Eibon says. One board, “cool eclectic,” boasted details like an icy blue headboard and a crisp white lampshade and throw blanket. Another, “bold red,” included a glitzy chandelier with a vibrant pink and red rug. In the end, it was Mae who had the final say. And she wanted fun and bright colors, like the pinks and oranges displayed in Eibon’s final vision. 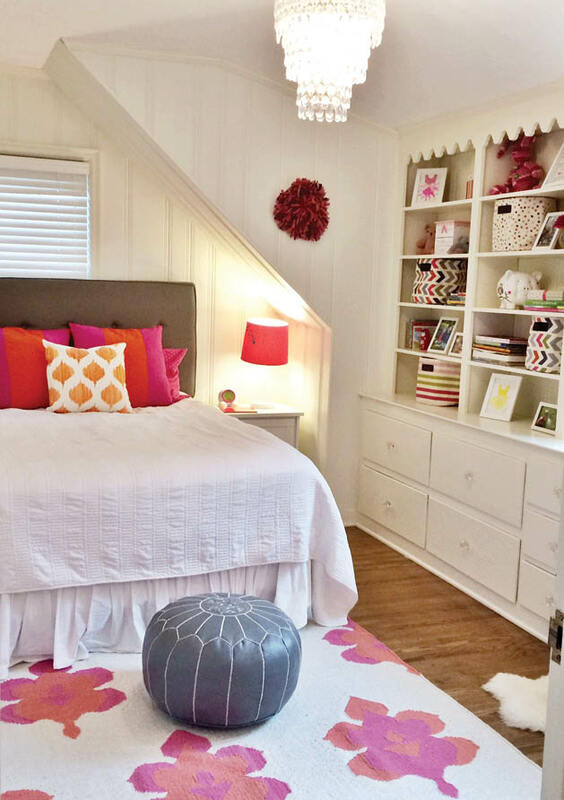 Using local, independent vendors, Eibon transformed what was once a dark study with a pull-out couch from Katie’s law school days into a dazzling white bedroom with pops of bright pinks and oranges. Behind the bed, covered in a fluffy white comforter, is a gray headboard that grounds the room and brings all the elements together. Framed prints with quotes from the song “You Are My Sunshine,” a song Katie and Jim often sing to Mae, hang on the wall. This personalized piece of the design process is especially important to the design team of Bambino Décor, who aim to sit down with every client and get a feel for the family’s tastes and vision. Not only does Mae’s new bedroom resonate with the family, but it’s a room Mae can grow into, which was important to Douglas. “I didn’t want something too toddlerish. I didn’t want to have to redesign it again two years later,” she says. Bambino Décor transformed a dark and dreary office into a bright and cheerful bedroom for 4-year-old Mae Douglas. Throughout the two-month redesign process, the couple was so impressed with Bambino Décor that they asked Eibon to consider helping them refresh the nursery. Eibon kept the yellow walls and added analogous bedding, a rug, window dressings and wall décor. “It was amazing what a difference that made,” says Douglas, who let Eibon have a little more creative freedom with the nursery. It would have been easy to just bring little Amelia, now 2, home from the hospital and use the exact same room they had used for Mae. But the small, personal touches made a big difference to the expanded Douglas family. One thing that helps Eibon relate to her clients is that she’s a mother herself, and understands that having children is exciting and emotional—and sometimes a little overwhelming. She loves bringing her own experiences to help families through their pre-baby, newborn, and little kid years. And now Eibon is balancing motherhood and entrepreneurship. Although it’s her childhood dream coming true, it’s also a lot of work. She laughs and notes that business ownership is certainly not a typical nine-to-five job, and that she can be tougher on herself than any boss might be. Regardless of the hard work, one thing is clear. Whether she’s inspecting teepees for toddlers, on the phone with merchandisers in Europe or chatting over coffee with a potential client, Eibon is right where she wants to be—at the shop around the corner.